Crystal Natural Body Deodorant is a fairly unique natural deodorant choice. It is currently holding steadily at 4.1 stars on Amazon, which the majority of users claiming it works pretty well. However, we do need to address the elephant in the room. So, let's get right into this natural deodorant and see if it lives up to our expectations. Crystal Natural Body Deodorant is a very unique deodorant. This deodorant is made from mineral salt and is among the best at getting rid of body odor. While it is not the best at absorbing moisture, it keeps odor at bay for nearly 24 hours. In addition, the crystal lasts for almost a year or more with the intended use. However, the mineral salt can be irritating for sensitive skin, so be aware of your skin type. In addition, some brands have started adding aluminum alum to their crystals in an attempt to get into the antiperspirant game. Since aluminum is probably one of the reason you are making the switch to natural deodorants, make sure your crystal is 100% natural. Now, it may sound weird, rubbing a rock of mineral salt on your armpit, but it actually does not feel much different than any other stick deodorant. Thankfully, it is not rough or coarse. The mineral salt glides easily and apparently feels very smooth. So if you are worried about it being rough, don't. Speaking about the ingredients, Crystal Natural Body Deodorant only has one ingredient. Mineral Salts. Now, this is where it gets a little tricky. Because while this is 100% natural and there is no added ingredients or chemicals, this deodorant still contains a type of aluminum. However it is not the same as the aluminum chlorohydrate, or other variations, included in many commercial brands of deodorant. That is the Mineral Salts, or Potassium Alum. This is in fact aluminum, though it is not like other forms of aluminum. It is a natural variant of aluminum which is far too large for the sweat glands to absorb, unlike aluminum chlorohydrate. Potassium Alum simply creates a layer of protection over the area that eliminates the odor creating bacteria. It does not get absorbed by your skin. Nevertheless, this deodorant does contain a type of aluminum, just not the bad stuff that is in most deodorants. Now surely, the whole aluminum thing is going to turn a lot of people away from this natural deodorant, regardless of the nature of the ingredient. But if you are still on the fence about Crystal Natural Body Deodorant, there are quite a few benefits to using this brand. Due to the deodorant only containing one ingredient, being the mineral salts, you do not have to worry about the quality of a bunch of different ingredients. In addition, when using this, it leaves no residue like some other brands. It will not stain your clothes or your skin, or leave white marks like other stick deodorants. What's more is that this deodorant is tested by Dermatologists, meaning it is safe to use on your skin and should not leave a rash. In addition, Crystal Natural Body Deodorant is hypoallergenic, which means it does not contain any known allergens like baking soda or otherwise. Plus, for those of you who are living the lifestyle, Crystal Natural Body Deodorant is vegan and cruelty free, meaning it has never been tested on animals. Crystal is the name of the company that manufactures Crystal Natural Body Deodorant. The company started by wanting to provide deodorizing products that are effective, safe, and good for you and the world. Since the beginning, they have been committed to their promise to use only safe ingredients, the use of environmentally safe packaging, and the refusal to test on animals. However, they are not just focused on staying true to their mission and nothing else. They realize that everything can be improved in one way or another. For Crystal, they have created new products and worked to increase the number of customers they reach. Crystal prides themselves in being one of the longest lasting deodorants on the market. Not just in terms of effectiveness, but also in lifespan. The mineral salt crystal that is the base and sole ingredient of their deodorant can last over a year with suggested use. Crystal Natural Body Deodorant has expanded their deodorant line quite a bit. Now, besides the unscented deodorant that we are reviewing here, they have a bunch of other scents. These include chamomile and green tea, lavender and white tea, pomegranate, and vanilla jasmine. In addition, they also have other deodorant options besides the stick. Crystal has available roll-on, spray, as well as invisible solid sticks for you to choose from. All are made with the same natural and safe ingredients as their Crystal Natural Body Deodorant made from mineral salts. Crystal Natural Body Deodorant is made from one of the best ingredients to fight body odor. Mineral salts are great at eliminating body odor and are featured in quite a few natural stick deodorants. While it does contain potassium alum, it is not the same as aluminum chlorohydrate or other variations. This form of aluminum has particles that are too large to be absorbed by the skin. This results in a safe barrier being formed that can help keep wetness down and odor to a minimum. This natural deodorant contains only one hypoallergenic ingredient. Mineral Salts contain no known allergens, making it the safest choice if you are unsure of your allergies. The last thing you want is an allergic reaction to your deodorant. In addition, this deodorant is also free of any and all chemicals, parabens, and phthalates. If you are living a vegan lifestyle, perk those ears up. Crystal Natural Body Deodorant is vegan, as well as cruelty free. This means that in no period during the production or testing of this product, was it tested on animals. There have been various reports of this product not working as it should. Many have said that they either smell the same or worse after using this product. However, this is not an antiperspirant. It is purely a deodorizer, as there are no absorbent ingredients featured here to combat your sweat. One kind of crumby tactic that Crystal Natural Body Deodorant uses here is their marketing of their deodorant for men and for women. Both mineral salt stick deodorants are exactly the same except for the color of the packaging and the price. On Amazon, the womens deodorant is actually almost $2 cheaper than the one marketed towards men. Why they are not the same price is beyond me, as they both contain the same one ingredient. Since each person's bodies are completely different, it is no surprise that some people are having an issue with this deodorant. It is certainly made for people who do not sweat a lot but still struggle with BO. So if you are looking for a good antiperspirant, probably best to look elsewhere. However, if you are looking for the best deodorizer, look no further. Mineral Salts are naturally perfect for taking on odor causing bacteria, and do so without the help of chemicals that have possible side effects. And if you are worried about the mineral salt stone being rough, have no fear. 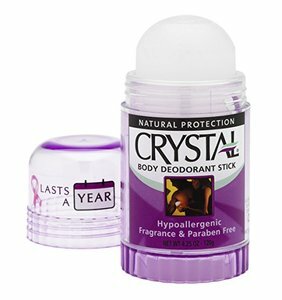 Crystal Natural Body Deodorant actually made it so it looks and feels as close to a regular stick deodorant as possible. Which is always nice because it can be weird and uncomfortable when you first change over from standard deodorants to a natural brand. This will hopefully cushion the blow to your armpits. If you are looking for something to help with your body odor, this is probably the product for you. Right now, you can grab a 4.25 ounce stick of the Crystal Natural Body Deodorant for $7.76 on Amazon. For all other information regarding the best natural deodorant, head on back to Green and Growing. Here are some top questions that I found for people seriously considering buying Crystal Natural Body Deodorant. Does this contain any aluminum? It does contain Potassium Alum. However, it is far different than aluminum chlorohydrate or others most commonly used. See the ingredients section of the article. Does the scented line of mineral salt deodorant work the same? Yes, the scented Crystal deodorants have the same effectiveness as the unscented.